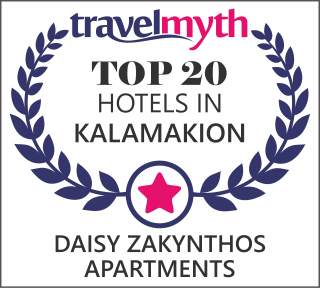 The Daisy Zakynthos Apartments are located on one of the most beautiful islands of the Ionian Sea, the magical and poetic Zakynthos. From the moment you first enter the apartments you will feel the friendly and relaxing atmosphere as well as the warmth and comfort of our fully equipped accommodation. The famous Greek hospitality at its best. The complex also includes a swimming pool, children's pool, children's play area and snack bar. 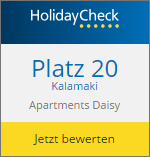 Just 50m from the center of the family resort of Kalamaki and 300m from the beach, the Daisy Zakynthos Apartments are ideally located for a family vacation in a quiet and relaxing area surrounded by many trees and flowers in well kept gardens.